You’ll be spoiled for choice for things to see and do during summer in the Alps, and Peisey-Vallandry in France is the perfect base for enjoying outdoor activities like mountain biking, road biking, rock climbing, rafting, swimming, and more. We’re thrilled to have our summer chalet, Chalet Cairn, neighbouring Vanoise National Park – a well renowned destination for hiking trails and watching wildlife. In Peisey-Vallandry the chair lifts are open for mountain biking in July and August. The Vallandry Lift opens daily from 9:15am to 12:50pm, and 1:20pm to 3:50pm during the summer mountain biking (MTB) season. Lift timetables and track maps can be found on Les Arcs’ website. The Peisey-Vallandry/Les Arcs MTB park has more than 180km of trails for all abilities. 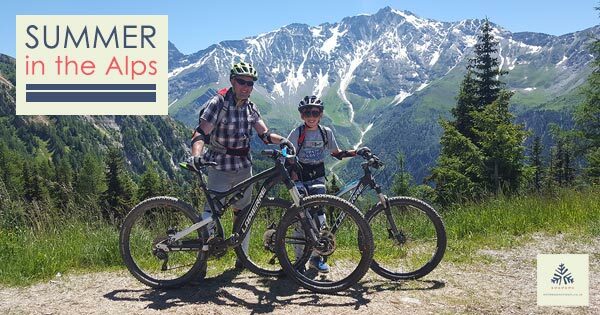 From green trails (for beginners, including children) to black trails (for experts) there are trails for all levels of skill and fitness, spanning the area from neighbouring town Bourg Saint Maurice, at the foot of the mountain, to Arc 2000 in Les Arcs. There are 5 MTB practice parks ideal for people new to the sport to gain confidence in their mountain biking skills, or for children and families. There is a MTB trail at Mille8 which is perfect for beginners too. For intermediate riders there are several blue trails for different branches of MTB: 3 downhill trails, 3 endurance routes, and the fun trail at Mille8. The expert trails in the bike park include 2 red and 2 black downhill trails, 2 black endurance routes, and 2 red cross-country circuits. MTB bikes and gear can be hired from Intersport Vallandry, open daily. Remember they close for lunch! The French Alps are well-known for its road biking climbs in summer, with the Tour de France this year setting-off its 12th stage from neighbouring town Bourg St Maurice. 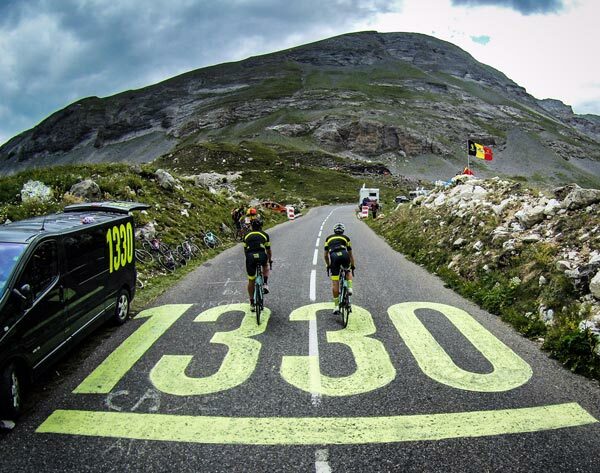 Our partners 1330 Road Cycling can organise fully supported Alpine cycling trips so all you need to worry about is how long you ride for each day. People love coming to Vanoise National Park to walk the many hiking trails available for all levels of fitness, and one of the park’s gates is located in Nancroix near our Chalet Cairn. Guests can walk up to Refuge Rosuel, at the entrance of the famous park. It is about a 30 minute uphill hike. Vanoise is the first national park created in France and is home to over 1000 species of flora and fauna – you may even see some wildlife of your walk like an ibex, chamois, or marmot. You’ll be able to admire the spectacle that is Vanoise National Park’s lush forests, alpine land, fresh streams and lakes, steep hills, and mountain passes. Chalet Cairn is situated almost on top of the GR5, which is a famous hiking route stretching north to south of the Alps. North is down, towards Landry and Bourg Saint Maurice. South is up, towards the national park where you can really get amongst nature. Cars are permitted no further than the refuge. So although you will surely be accompanied by other hikers on a well marked path, you will find yourself in a serene, untouched region. 3 hours southwards you will arrive at Lac de la Plagne, a beautiful mountain lake with a tiny restaurant. If you are fortunate you will see a golden eagle or the bearded vulture, which nest this side of the park. We advise you to take communications and a map as well as plenty of food and water. Check the weather, wear and take the correct hiking equipment. Conditions in the mountains can change very quickly. Hikers should check pathways themselves, these times are a guide only. We take no responsibility if the hike takes longer or is harder than expected. Maps can be found at the Peisey tourist office or bought online. A number of routes available. A number of routes available. Return via the Vanoise Express to Peisey village. There are some beautiful heritage churches and castles to visit in the Peisey-Vallandry area which you can hike or drive to. Notre-Dame-des-Vernettes chapel is a special historical monument open to visitors everyday from 9am to 5pm. For more than 200 years the chapel’s original appearance has been preserved and lovingly restored by the people of the valley. It is possible to walk to the chapel from our chalet. You could also take part in a guided tour of some of the heritage churches to make the most of your journey into the world of baroque art in Peisey-Vallandry. The Via Ferrata on our doorstep is a very popular protected climbing route. Climbing the Via Ferrata only costs the price to hire your harness and helmet and is close to Vanoise National Park next to Chalet Cairn. There is also an outdoor climbing wall in Les Arcs, with 20 climbing routes for all levels, which is great for children too. The wall in Arcs 1800 (Villards) is open Sunday to Friday, equipment is provided, and is supervised by a mountain guide instructor. Imagine flying over Peisey-Vallandry valley with eagle eye views of Mont Blanc! First flight paragliding lessons are available for adults and children with training course for all levels. There are several options for paragliding in summer in Peisey-Vallandry and Les Arcs. Prices start at €70 and options include discovery flights, ranging in duration from 10 to 25 minutes, and longer flights of an hour or longer which can sometimes go over 3000m high above the mountain peaks. There is an array of water activities in the area to suit beginners and advanced level participants, including white water rafting, kayaking, wakeboarding, and stand up paddleboarding. Check out H2O Rafting for details on water sports. If you have a car there are great destinations nearby like Annecy Lake, which is a 1h45 drive from the chalet and is popular for boating, wakeboarding, and jet skiing. Le Bourget du Lac, near Chambéry, is a 1h30 drive away and attracts people to its lovely beach from all over for sailing, water skiing, and fishing. For passionate wakeboarders, and for beginners from 7 years and up, there is a Wakeboarding Park in Albertville, just a one hour drive away. The park uses a water ski cableway which tows wakeboarders and water skiers without the need for a boat. Plan d’Eau is a great swimming spot for the family about a 15 minute drive from Chalet Cairn. Plan d’Eau is a small lake at the foot of the mountains near Landry and is perfectly set up for an afternoon of sunbathing and taking a dip. There is an ice cream stand and small restaurant there too. Mille8 at Les Arcs is a fabulous health and wellness facility for adults and families. Mille8 Piscine is a child friendly swimming pool and visitors love taking in the pool’s spectacular view of Mont Blanc. The pool area also has bubble massage beds, jacuzzis, cascades, a cave, splash pad, and a multi-lane water slide, “pentaglisse”, to entertain the whole family. Relax your body and mind at Mille8’s wellness area by indulging in one of their 2 saunas, 2 hammams, or the resting room, or use the fitness centre’s variety of weight and cardio-training machines. Or stay in the chalet and use the facilities, which include an outdoor hot tub (with incredible views), sauna and relaxation room. Our wonderful in-chalet masseuse, Bryony of Alpine Hands, is available all summer. For many people a summer getaway would not be complete without a round or two of golf, and you’ll find lots of options to choose from in the area including two courses at the golf club nearby at Les Arcs – an 18-hole course, and a 9-hole course. Les Arcs golf course is located on the side of the mountain facing Mont Blanc with breathtaking views. Riding horses or donkeys is a unique way for young and old to view the natural features of Peisey-Vallandry: waterfalls, glaciers, and mountain vistas. Trail orienteering can be a fun way to get the family working together (or competing in teams!) to find your way around a given area. There are permanent orienteering trails set-up, both starting by the refuge de Rosuel of Peisey-Vallandry, and you can choose between the family trail, which takes 1-2 hours, of the sport trail which takes 2-3 hours. Palais de la Mine is a bit of fun history for the family. The big house has an interesting story dating back to the early 1800s when the French School of Mines settled down in Les Monts d’Argent – the name of Peisey during that time. Le Palais is close to Chalet Cairn in Nancroix, just a bus ride and short walk for kids, and nearby is one of our favourite restaurants, Le Fer À Cheval. If the kids (or the parents) don’t want to miss the latest summer blockbuster during your stay in the valley, Vallandry is home to Cinéma L’Éterlou, a short drive from Chalet Cairn in Nancroix. After spending the day out and about there’s nothing better than a lovely meal and cold drink at a local alpine eatery. Le Fer À Cheval, the restaurant mentioned above, is just below Palais de la Mine. The bar and restaurant is open everyday and serves homemade delicacies like ice cream, faiselles (fromage blanc), and pastries. The local bus also stops there making it quick and easy for guests to return to Chalet Cairn in Nancroix. Auberge de Cassiel is settled in the heart of Vanoise mountains and serves gourmet dishes from fresh local ingredients. The restaurant’s sundrenched terrace is a wonderful spot to enjoy a beautiful meal and the surrounding countryside. Le Chateau de Feissons’ restaurant is set in a unique, medieval hall and specialises in elegant, traditional cuisine. The 13th century castle is open for lunch from Monday to Sunday over summer and the dining area will surely make your experience unforgettable. Le Refugepizz is our lovable, local pizzeria in Plan Peisey. They have a huge choice of pizzas and salads, and you can dine-in or take away. Open 6 days a week, closed on Tuesdays, Le Refugepizz is a hit for the whole family. Crêperie Chez Félix Rosuel is exclusively open in summer – an amazing place to enjoy sunny days. Not only is the food great, you can also spend many hours there playing mini-golf and relaxing on the large terrace. Le Cœur de Vall’ has a gorgeous summer menu to match how lovely their terrace is – with panoramic views over the valley. Open everyday except Monday, you should stop in to appreciate Le Cœur de Vall’s creative, modern twist on traditional cuisine, and their friendly service. Le Petit Hibou is opening this summer 2018, again, just below Palais de la Mine, a short and interesting walk from Chalet Cairn. We are looking forward to an international menu put together by a truly amazing chef. More on this when the restaurant is unveiled! There is a bus stop just 200m from Chalet Cairn in Nancroix. The free shuttle service runs regularly between Nancroix, Peisey village, Peisey-Vallandry and Rosuel. Click here for an example Peisey-Vallandry bus time table for summer 2017. We will update to 2018 when it becomes available. Summer weather in France is lovely and mild in the Alps, with maximum daily temperatures usually between 18°C – 25°C, and lows of around 11°C – 13°C at night. Be prepared to wear layers of clothes so you can adjust to the weather, and your activities, e.g. paragliding is going to be a lot chillier than hiking. An easy way to find out what’s on in Peisey-Vallandry is to keep an eye on the official Peisey-Vallandry tourist website. There are lots of events throughout the year, traditional, fun, family or adult. Throughout July and August, Chalet Cairn is available fully catered, or Bed & Breakfast, in Peisey-Vallandry and is perfectly positioned for summer activities in the Alps. A seven night stay in Chalet Cairn, with en-suite rooms, includes breakfast, and dinner with wine on six evenings. Take in the views of the valley while soaking in Chalet Cairn’s outdoor hot tub, or enjoy our sauna and relaxation room after a day of outdoor activities. Enquire about our B&B rates and special offers – email us at [email protected].